Lilah and I read this one together, not realizing it’s third in a trilogy, but we weren’t at all lost and very much enjoyed it. We were both ready to go back and read the first two (OUT THE REAR WINDOW and TO CATCH A GHOST). Nerdy Charlie Hitchcock and former bully Tyler Yu work together to solve the disappearance of Abracadabra, the founder of the Hocus Pocus Hotel, but soon Tyler disappears during a mystifying magic trick! 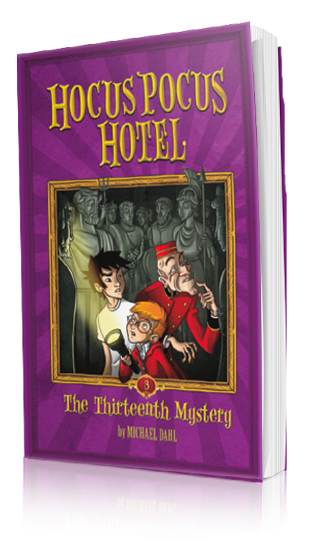 Charlie is convinced he can find a way to the hotel’s hidden thirteenth floor and solve the mysteries. This is a fun read, and the diagrams explaining the magic tricks are a huge part of the appeal. Lilah is fascinated by magic tricks, so the explanations for how the illusions worked were loads of fun. Tyler and Charlie are a fun pair: very different, but working together as an excellent team. There’s plenty of suspense and mystery, and the resolution had us cheering. 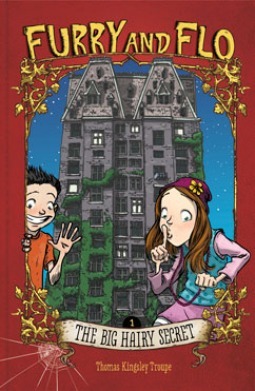 Highly recommend this middle-grade chapter book series. Lilah and I had a blast reading this funnier-than-scary homage to children’s horror/gross-out books. AJ Zantony is staying at his great-aunt Zsofia’s house, the Zantony ancestral home, Zala Manor, while his parents are away (“McChiller” seems to revel in the thinness of the excuse to get the parents out of the way). His stay coincides with Zsofia’s annual Halloween party, which raises funds to keep the crumbling old manor intact, and Halloween this year occurs at the blue moon. AJ is a typical twelve-year-old, plagued by the school bullies, and is not thrilled when a girl is assigned to be his science partner. Worse, Emily is the Scully to AJ’s Mulder, insisting that the odd occurrences plaguing Zala Manor must have logical explanations. As midnight on the Halloween/blue moon convergence approaches, AJ and Emily must juggle party duties, dodge zombie, vampire, and skeleton pirates, and…oh, no! Did the bullies show up to the party?! Zala Manor is the sort of house I dreamed about as a child: hidden staircases, secret passages, tunnels, creepy crypts. And, of course, the talking rat (really a parrot trapped in a rat’s body) who helps AJ and Emily figure out how to stop the pirate spirits. I recommend this funny, scary, high-interest chapter book for reluctant readers and boys in particular, but Lilah and I both enjoyed it. When we reached the end and saw the teaser for the next book in the series, SECRET OF HAUNTED BOG, she was ready to read that one, too. Flo Gardner has moved several times since her father died, but nowhere as creepy as Corman Towers, the ominous apartment building at the center of this series debut. Flo adjusts to a new place again, but the real story begins when she makes friends with Furry (short for Ferdinand), the boy she had earlier seen running the halls in his underwear. And he’s the werewolf who stole her popsicles. The two unlikely friends team up to tackle the Big Hairy Problem – giant spiders coming from a strange portal in the basement. My daughter (first grade) and I breezed through this fun book. I think she’s the perfect age for it, though Flo is in fourth grade. Children who like their scary stories truly terrifying will be disappointed, but children (like mine) who prefer a bit of humor to temper their horror will eat this series up. I enjoyed reading it aloud (and the cartoon-like illustrations are darling). Lilah really enjoyed getting to know Flo and she was delighted when she and Furry became friends. She was totally engrossed in their adventure, and she agreed that the illustrations were the perfect complement to the light story. She also noted that it wasn’t *really* scary, just the kind of scary that’s fun. This would probably be a good choice for reluctant readers, with its high interest and fast-paced plot. Children interested in the paranormal will also enjoy. This is the fourth book in the TALES FROM LOVECRAFT MIDDLE SCHOOL series, and as I expected, it delights. The series begins with PROFESSOR GARGOYLE. Each hardcover features a lenticular image that shifts a normal teacher or student into his/her/their demonic alter egos, an image that foreshadows the story within. The premise: Robert Arthur is moved to Lovecraft Middle School, a brand-new, state-of-the-art facility built over the old Tillinghast Mansion site. Oops. Naturally, a connection to the old mansion (which mysteriously disappeared with its inhabitants) still exists, and even more naturally, Robert is the one to find it. In this installment, it is nearly Valentine’s Day and Lovecraft Middle School, among other more supernatural occurrences, also has to deal with a blizzard. It’s Robert to the rescue, along with his best friend (and former bully), his two-headed rat, and a ghost. There are plenty of otherworldly creatures and mild scares, making this an excellent readaloud for a Lovecraft-fan parent to his/her horror-loving child. If you’ve read Lovecraft, the references will tickle you, but you won’t be lost if you haven’t. Highly recommended for reluctant readers who need a page-turner, anyone who enjoys horror, and boys who only like books with boy protagonists. Source disclosure: I received a copy of this book courtesy of the publisher.